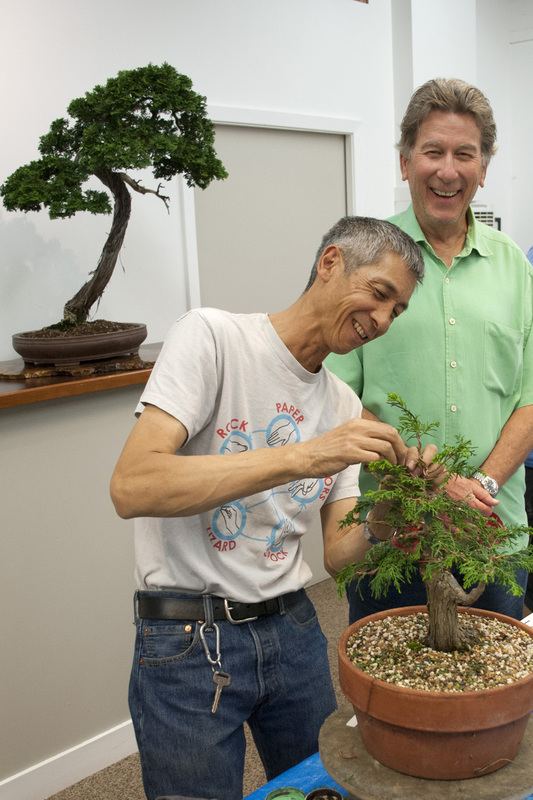 On September 6, 2016, at the Marin Art & Garden Center, Ross, California, Bonsai instructor and artist Randall Lee of Alameda, California, presented the members of the Marin Bonsai Club with a demonstration on Chamaecyparis obtusa, common name – Hinoki Cypress, a native of central Japan. C. obtusa has a scale like leaf. In a handout, Randall identified some of his favorite varieties of C. obtusa as “Well’s Special”, “Nana”, “Gracilis”, Gracilis Nana”, and “Torulosa”. Similar to the Hinoki Cypress is Chamaecyparis pisifera or common name – Sawara Cypress or False Cypress, a native of central and southern Japan, and on the islands of Honshu and Kyushu. C. pisifera have a pointed leaf tip. Some of his favorites are “Nana” and “Filifera”. He also identified bonsai sizes. Shohin are a maximum of 8 inches in height. Kifu are the next size up to 12 inches in height. Chuhin with a maximum size of 18 inches in height. 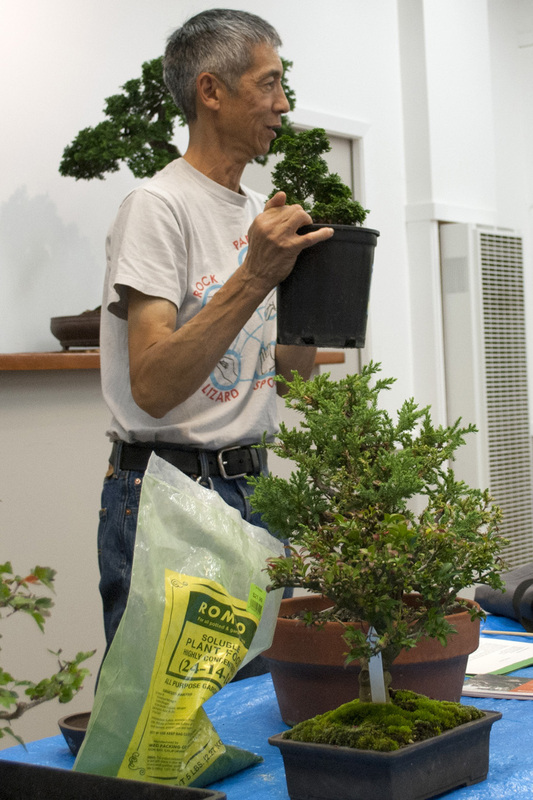 During the demonstration, Randall chose to use Kifu or medium size tree, and not worry so much about measurements. According to Randall, you want a big trunk with taper and small branches with good interior foliage. He said to look for a plant with good viable, short interior branches that provides an escape leader which can be cut back to a new shorter leader. There is a short window to do this without losing the small interior branches. 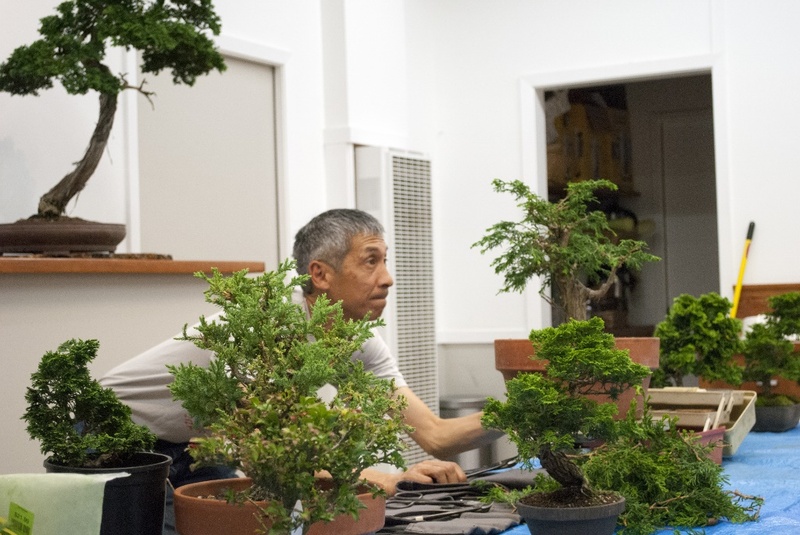 It usually takes Randall about two repotting’s to go from two or five-gallon nursery containers to a bonsai training pot. At the end of three years you can get it into a final bonsai pot. Randall described the trees are relatively free of pests and diseases. Sometimes leaf eating caterpillars and thrips will attack when the tree suffers under stress. Root rot can occur under these conditions: uneven watering, overwatering, if pot overheats and roots die and then gets overwatered. They like full sun, but if you live inland you can put them under shade cloth to prevent sun burn on the foliage. This will also help the pot from getting too hot and preventing root death. After pruning, if it is hot or very sunny it’s a good practice to place the tree in part shade for a few days. Mist or spray foliage since they come from an area with summer rain. One of the biggest challenges with Hinoki Cypress is keeping the foliage alive on the inner branches next to the trunk. This is especially difficult for shohin size trees. If you manage to grow a large trunk with taper, the small branches get shaded out and die. 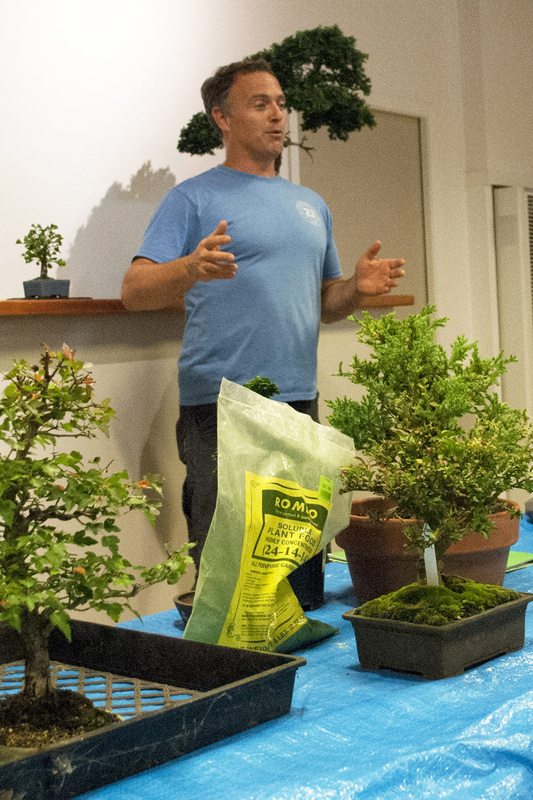 During the demonstration, Randall worked on Hinoki Cypress that appeared healthy, that is the foliage was green, bushy and with runners. He removed a lot of foliage, selecting only the branches he wanted to keep for styling the tree. He used cut paste on large wounds. He then wired the remaining branches and shaped the tree’s branches. Dan Keller won the finished demonstration tree by purchasing the winning raffle ticket.